Scalp scars from any procedure such as scalp reduction, old plug surgery, trauma or neurosurgical procedures can be treated to minimize the look of the scar. 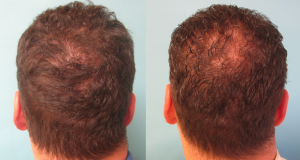 Modern hair transplant yields natural, proven, and permanent results along with special wound closure techniques to minimize scars. 1. Simple Scar Revision: This method can be used if there is a wide scalp scar due to the initial technical problem during the wound closure. 2. Scar Revision and Trichophytic Closure: This method allows the hair to grow inside the scar, which helps to minimize the contrast between the scar and the surrounding areas of the scalp. 3. Hair Transplantation inside the Scar: In this method, the hair will be harvested from other areas of the scalp and will be transplanted inside the scar to blend the scar with the rest of the hair. The hair will be harvested through the FUE hair transplant technique. The benefit of using this technique is that with FUE, follicles are extracted individually, giving the surgeon the opportunity to place them into the scar without having new scarring. 4. Scalp Micro Pigmentation on the Scar: By introducing dermal pigments into the scar, the visibility of the scar can be significantly improved because it helps reduce the contrast in color between the scar tissue and the surrounding scalp area. In order to know which technique would fit your needs, it is recommended to visit an experienced hair transplant surgeon. This entry was posted in Non Surgical Scar Revision, Revision, Scalp Scars, Scars, Surgical Scars and tagged Scalp Micro Pigmentation, Trichophytic Closure by Michael James. Bookmark the permalink.